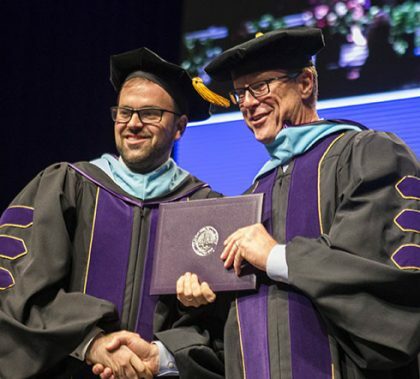 Dr. Tim Griffin, GCU’s pastor and dean of students, officially received his doctoral degree Friday afternoon. It wasn’t an ostentatious presentation — he merely was first in line when diplomas were handed out, then went back to his seat — and that was how he wanted it. But his doctoral tam did get a little attention. 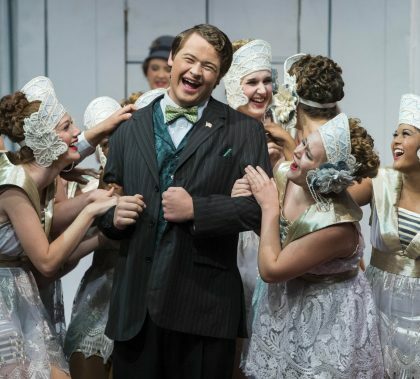 “Of Thee I Sing,” the musical political satire that opens tonight at Ethington Theatre, gives the audience a delightful reason to laugh out loud at a fictional presidential campaign. The delight comes in all forms, from the visual spectacle of 1930s-era costumes, a stage filled with stars and stripes, humor ranging from subtle to slapstick, singing that is at once beautiful and hummable and cast full of actors who clearly enjoy the art of comedy. Pantheon Enterprises’ co-founder and CEO Laura Roberts’ message to Grand Canyon University’s Colangelo College of Business students Wednesday was widely applicable for future business professionals: Learn. Think critically. Understand. Act. And, if necessary, rebel. GCU’s Project Management Club and business students are collaborating to host what may be the largest TEDx program ever held in Arizona. The all-day TEDx event, scheduled for March 1 at GCU Arena, will feature short, powerful talks on a almost any topic. ” I have no doubt we will fill the Arena for the local program,” said business student Jedidiah Woods. Larry Hinkle, a former United States Marine, stopped by campus Wednesday during the cross-country walk he’s doing to raise money and awareness for fellow veterans. He was extremely impressed by GCU’s Veterans Center. “My eyes have been opened here. 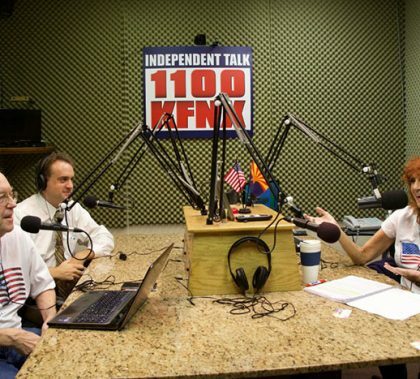 I never knew this type of place existed,” he said while visiting with students. Dr. Chris Anderson completed his dissertation in February, and it was so good, it received an award from the International Association for Invitational Education. 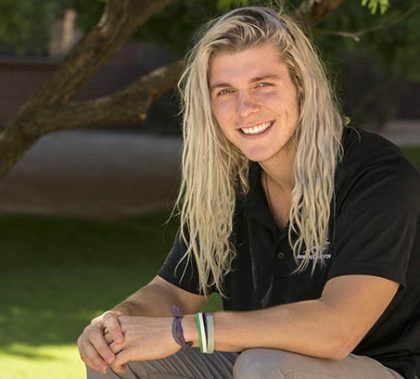 Anderson focused his GCU research on the connection between emotional intelligence of school leaders and a school climate intentionally based on trust, respect, optimism and care. The first “Lunch and Learn” of the Integration of Faith, Learning and Work speaker series featured a discussion about what it means to not live by bread alone. Dr. Moronke Oke of the Colangelo College of Business stressed the importance of putting purpose, principles and people at the top of our pyramid, and Joshua Danaher of the College of Humanities and Social Sciences talked about being authentic in our daily thoughts and actions. The Integration of Faith, Learning and Work is an important part of the classroom experience at GCU, and this year the faculty is having more input than ever into the program. 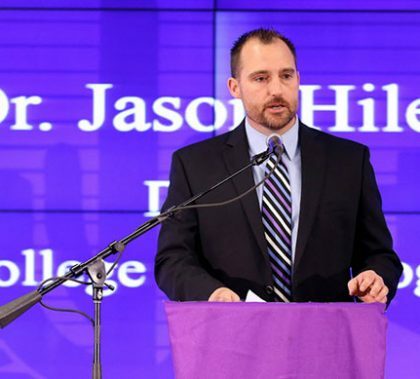 The goal, of course, is to benefit students, and Dr. Jason Hiles, dean of the College of Theology, is confident that will be the result of his decision to form a faculty task force to help him plan and execute the program. Members of the task force already are seeing the benefits. We all know the importance of good leadership, but what about followership? Dr. Rob Koonce, a GCU doctoral graduate, has written a book on the subject, and he’ll share his views Monday evening during the residency at the Pointe Hilton Squaw Peak Resort in Phoenix.